NATURAL HABITAT AND PREFERRED SITE: As the name implies this tree is a desert tree, native to southern Russia, Afghanistan and Pakistan. It grows well for some number of years in a wide range of soils in Texas if the drainage is good. It is fairly well adapted to west Texas but is dying out in the higher rainfall areas of the state. IDENTIFICATION INFORMATION: Eldarica pine is an upright, fast- growing pine with medium green needles. It normally keeps its foliage all the way to the ground. FLOWERS AND FRUIT: Inconspicuous flowers followed by seed bearing cones. BARK: Medium to dark brown and with a medium heavy texture. FOLIAGE: Typical pine foliage but seems to have a somewhat duller appearance. CULTURE: Eldarica pine is fast growing and does fairly well the first 5 to 10 years in any soil that is well drained. Is drought tolerant, in fact, it is totally intolerant of rainfall above 20 inches a year or regular irrigation from an irrigation system. It responds well to fertilizer but too much can contribute to the root disease problems. PROBLEMS: This tree is dying out in the eastern part of the state. Unfortunately the decline and death happens after the tree has reached some maturity. Root diseases start to hit and take the tree out rather quickly once the soil pathogens start to attack the root system. The problem can be abated with the use of horticultural cornmeal and the Sick Tree Treatment but Mother Nature is going to eventually get her way. Eldarica pine is a desert tree – it is not adapted to high rainfall or irrigation areas. Many people love evergreen trees, especially pine. But unfortunately certain pines are very difficult to grow in large portions of our state. I have a warning about a widely planted tree that is running intro trouble in Texas. The industry has pushed one pine tree in much of Texas that has turned out to be a disaster. 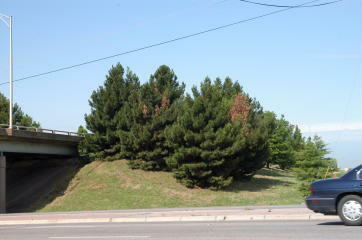 Eldarica Pine has been planted all over the state -- in home landscape, commercial projects, even along the highways. It's been commonly sold as a good living Christmas tree choice. The only problem is that all of these trees are dying. Eldarica, also known as Mondell and Afghan pine, is a desert tree. It has no chance long term in an irrigated landscape. It also has serious problems with the normal amount of rainfall and soil conditions we see in most of the state. It does okay in West Texas, but everywhere else it's getting root fungal disease and borers in the trunk. Nothing can be done short of applying the sick tree treatment to postpone the inevitable results. For better tree choice, although it will be extremely difficult to find, is Italian Stone Pine. The thing to remember is that with an organic gardening program, it's important to select native or adapted plants. Otherwise it won't matter what else you do. 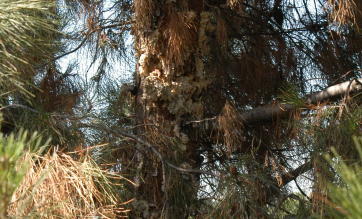 Pest problem for Eldarica Pine. INSIGHT: Eldarica pine is fairly well suited to West Texas and unirrigated sites. See other pine entries her for better selections.